I've got a bit of a different scenario over here and I'm just trying to get some input from experienced S2000 track junkies/racers. I'm looking to retrofit a well programmed 4 channel ABS system (can handle abuse, bouncing off rumbles, sticky tires, no ice-mode code browns, etc..) that can be operated stand-alone in my S14 240sx VQ35 engined endurance race car. I've boiled my options down to two: the AP1 S2000 (or AP2 if it can be run standalone, which isn't clear) or the BMW E46 M3 MK60 system. The latter choice seems to be the very popular at the moment for adapting into all sorts of cars. It's well documented and there are a couple of people who make PnP harnesses. However, someone suggested to me that the S2000 programming is actually very good. Pricing things out I can probably save close to $1k by going this route, which is far from insignificant. I also like the idea of keeping japanotronics in the car instead of bavaratronics. The MK60 system is definitely more complex as it requires yaw/lateral sensor and brake pressure sensors at the minimum (besides wheel speed sensors obviously). I could also theoretically get the DSC (stability control) working if I can adapt the steering angle sensor as well, although this isn't make or break by any means (and more custom work). It also has EBD for brake proportioning where the AP1 still uses a mechanical proportioning valve as far as I can tell. AP2 uses EBD? What it boils down to is, is the MK60 ABS programming $1k better than the S2000? The mechanical bits from that era I'd venture to guess are all equally capable. It's all in the programming. Please share your experience and thoughts and opines with your car. Would be greatly appreciated. AND, I'm currently just eyeing AP1 bits. I'd be more than happy to include AP2 in my shopping list if it can be run standalone. The MK60 system was part of a CANbus network yet it can be made to work in anything. Perhaps the AP2 can also(?). AP2v2 is EBD. Not sure if it uses yaw/G sensors for ABS, though I would bet it probably does. It certainly uses them for vehicle stability control. The ABS does need wheel speed input via CAN. I believe this is true for even AP1. 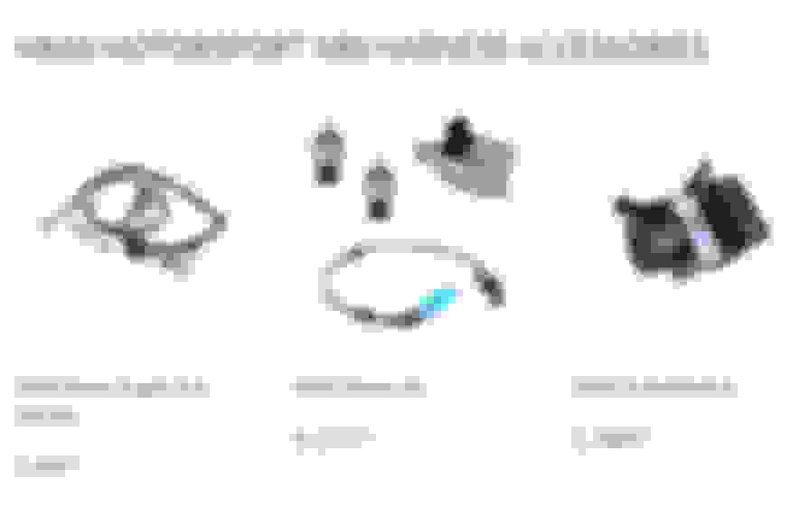 Corrected per post below. AP2v2 is extremely unintrusive while driving on track. I've driven it in dry and very wet/oily conditions. The one thing it does do is apply more brake than the pedal input if it senses the pedal was pushed in too quickly. There isn't a pedal travel sensor so I assume it's getting this from the brake line pressure sensor, for example if it sees the line pressure increasing too rapidly. Not sure if that's ideal for your purposes, but I seem to not have an issue with my driving style. Not sure if AP1 or AP2v1 have this function. How much is your time worth and how much is having the ability to send the MK60 out to be programmed with race software / custom parameters worth? Also, what is three channel (S2000) versus four channel ABS (MK60) worth to you? The AP2v2 with stability control has EBD. The 2004-2005 AP2v1 don't. The Honda has the brakes set on diagonals. I don't know if this is a problem, but I would imagine you would want front/rear master cylinders so you could adjust the brake bias. Thanks for the input, @shind3 . Exactly what I'm looking for. Not sure how true that is regarding the wheel speed input, although admittedly my CAN knowledge is elementary. Another 240 owner driver spliced in Z32 300zx sensors in the rear and used 240 sensors in the front for his AP1 ABS adaptation and that worked. Doesn't the ABS module handle the raw signals direct from the sensors? With that said, do you know where can I find an AP2 factory service manual? @Chibo , I think you're selling the S2000 ABS short bud! It is 4 channel otherwise I wouldn't be here in the first place and would just make the OEM 240sx ABS work (which is 3-channel and long gone and crap like all 90's era ABS). Also, programming the MK60 with the CSL/motorsport ABS map isn't as easy as people make it out to be it seems. It's expensive and I think you need a specific ABS unit that is capable of being re-flashed. Then on top of that, people who've had it done say it isn't even worth it as the standard M3 mapping is more than sufficient. Whether that true or not, who knows, but many BMW folk who I race against feel this way. @DavidNJ , Good to know with the AP2 versions. Thank you! As for the biasing and what not, all that is trivia for the time being. 4 channel ABS units typically only need two pressure inputs; one for the front circuit, one for rear, then 4 outputs for each corner. 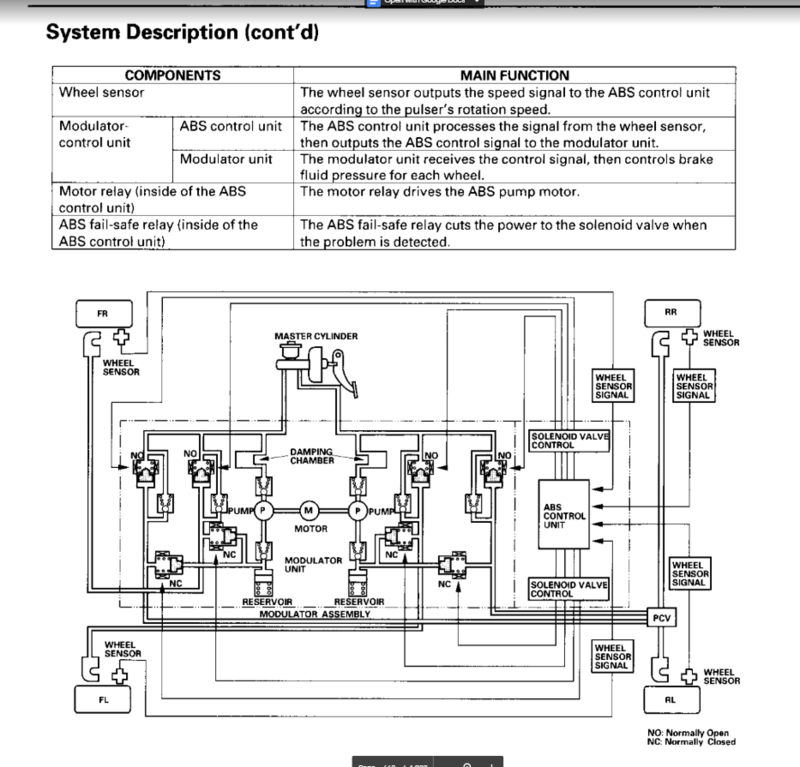 The AP1 system seems to have a traditional mechanical proportioning valve post ABS module for the rear corners (see 2000-2003 FSM page 19-26). AP2, assuming that it's EBD, shouldn't as that what EBD does in place of a mechanical unit (at least in the BMW system). Regardless, it's something I can sort out after the fact. 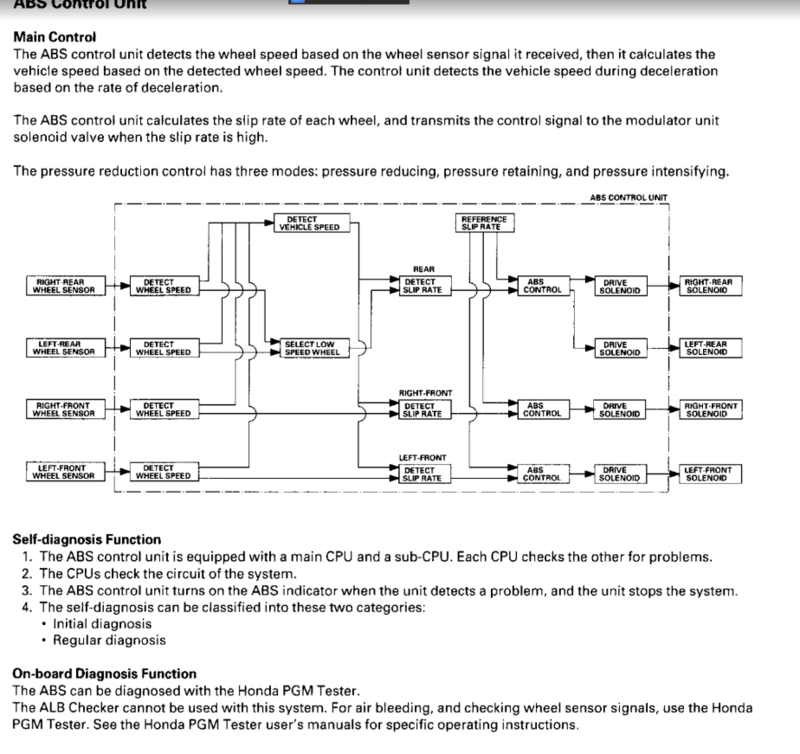 I just haven't come across an AP2 FSM that shows detail of the system. I've been dealing directly Race Harness Technologies (https://www.facebook.com/RacingHarnessABS/) in regards to the MK60 stuff. He makes all the kits for 3dmmotorsport. I'll be in about $1400-$1500 for all the MK60 system (not counting new brake lines), where most of the money is for the harness, but you can see the module/pump unit isn't cheap either. I can get an AP1/AP2 ABS module off of ebay for less than $80. Is that not 4 channel? It's monitoring and controlling each corner individually. Yes, you are monitoring the rear wheels independently, but look at the diagram there when it detects rear slip rate. It triggers ABS and drives the solenoid for both rear wheels, not independently like the front. Am I reading it wrong? Ah interesting. It's like a pseudo 4 channel system, not quite 3 channel. Thank you! Question is now if the later model ABS system can run standalone. I hate to be a guinea pig, but I may have to be. If you look at the diagram posted by gills, the S2000 brakes are split on the diagonal...there is no front and back. The idea is not proportioning but a fail-safe mechanism. Would it work plumbed and wired differently? IDK, but front calipers displace a lot more fluid than rear calipers, although they should be working at the same pressures. They have two other harnesses required, basic for $895 and with ecu/data acquisition for $1095. They recommend starting the the MK60 unmodified. While it is possible to put together an S2k based unit, there could be a lot of issues to be worked out. The question is: do you want to spend your time racing or developing an ABS system? So much technical info, but has anyone properly bled the oem abs modulator to begin with? I replaced oem brake master cylinder and cant seem to get rid of that spongy pedal feel im thinking theres air stuck in the abs modulator and it wont escape until i somehow bleed it while it's modulating and cycling the abs lines?